We offer a Full Line of Janitorial, Paper, Cleaning Supplies and Related Items! Tadco Supply has been a family owned and operated business for over 40 years and we pride ourselves in the personalized service we offer every customer. Our store offers equipment repair and key shop, rentals on floor and carpet machines and knowledgeable service people to help with your needs. We are a G.E. Lighting distributor and carry a large inventory. Special order items are also available. During business hours our experienced sales people are available to answer your questions and process your orders. After hours, orders may be placed via voice mail, fax or e-mail. Click Here For Our ONLINE Catalogs! For your convenience, we deliver. Our trucks cover all of the San Francisco Bay Area including as far south as Salinas, Monterey, Hollister; north to Napa, Sacramento, Chico, Redding and east to Stockton & Modesto. We also can ship orders via UPS or common carrier to anywhere in the U.S. If you are interested in a Tadco Supply charge account or maybe just being entered into the computer for easier shopping, please don’t hesitate to give us a call. We hope that the following pages will show how we can better serve your needs quickly and efficiently. We look forward to working with you. 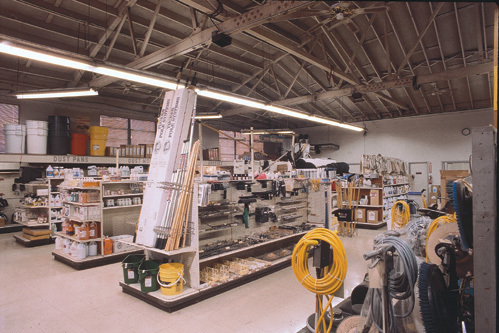 Prior to starting Tadco Supply, owner, George Taddie, owned and operated his own janitorial service for over 30 years. The knowledge and experience he gained has been passed along to his Tadco Supply staff and is now available to you. We offer our customers expert advice on all of their cleaning problems. Through both on-site help and on-going training, Tadco Supply can solve your cleaning, supply, and installation problems. Monday thrrough Thursday - 7 A.M. to 7 P.M.
Friday - 7 A.M. to 5 P.M.